Just like its name, Jungle Man is a towering plant. Seems like something you would see in a tropical jungle with dark blood red blooms. 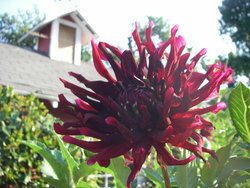 This Dahlia is a sport of Hollyhill Tempest.